In the decade after the end of World War II the nations of Western Europe sought to encourage co-operation and integration amongst one another, mostly in an effort to avoid ever repeating the circumstances which had thrown the continent into turmoil for decades before. The first move toward this goal was the establishment of the European Coal and Steel Community in 1951. Six years later the Treaty of Rome was signed by France, West Germany, Italy, Belgium, the Netherlands and Luxembourg - establishing the European Economic Community, which would act alongside the ECSC and Euratom, another new creation designed to foster co-operation on nuclear power. These three branches were merged in 1968 to form the European Communities (EC). Ireland would first attempt to join the EC in 1961, along with Britain, Denmark and Norway. Due to the strong economic links between Ireland and Britain, the Irish application was essentially tied to the British application - which became a problem when French President Charles de Gaulle vetoed the application over fears that British membership could lead to American interference in the affairs of the EC. This rejection resulted in the suspension of all other applications, so that none of the four states which had applied would be accepted. The four would try again in 1967 with much more success. De Gaulle was succeeded in 1969 by Georges Pompidou, who was less averse to British membership. 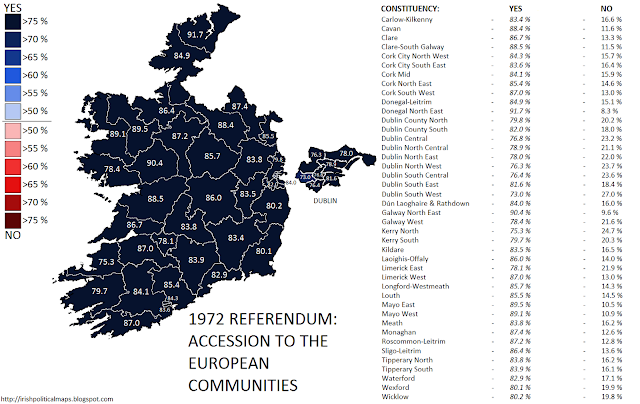 As EC accession would involve a change to Bunreacht na hÉireann, a referendum was legally required before Ireland could accede. This was held on 10 May 1972, with the Fianna Fáil government and Fine Gael main opposition uniting to call for a Yes vote. The Labour Party, trade unions and Provisional and Official Sinn Féin - each suspicious of the EC and the effects of Irish membership of it - campaigned for accession to be rejected. The State may become a member of the European Coal and Steel Community (established by Treaty signed at Paris on the 18th day of April, 1951), the European Economic Community (established by Treaty signed at Rome on the 25th day of March, 1957) and the European Atomic Energy Community (established by Treaty signed at Rome on the 25th day of March, 1957). No provision of this Constitution invalidates laws enacted, acts done or measures adopted by the State necessitated by the obligations of membership of the Communities or prevents laws enacted, acts done or measures adopted by the Communities, or institutions thereof, from having the force of law in the State. The result proved highly surprising to all concerned: the electorate overwhemingly voted for accession. In stark contrast to every referendum which had preceeded it, every single constituency featured similar results: the Yes vote reaching the high 70s to high 80s across the state. The lowest share in favour of accession was in Dublin South West - still an emphatic victory at 73%. The highest, meanwhile, was 91.7% in Donegal North East. Ireland joined the European Communities on 1 January 1973, along with Britain and Denmark. Norway's electorate had rejected accession in its own referendum. Results of the referendum by constituency. Click to see full-sized.